Microbes are the planetary engineers of the biogeochemical cycles that sustain all life on earth. At the molecular scale, the biological turnover of such key elements as hydrogen, carbon, oxygen, nitrogen, iron and sulfur depends on the enzymatic transfer of electrons from reduced (electron-donating) to oxidized (electron-accepting) forms of these elements. On the global scale and over geological time, reduced substrates and oxidized products map to a vast, often circuitous flux between the interior depths of the mantle and the oceans, land, and atmosphere. At the heart of this ‘global metabolic pathway’ lie the genes encoding the electron-shuttling oxidation-reduction (redox) machinery buried in cell membranes. Despite the planet’s turbulent history, with mass extinctions brought on by asteroid impacts, glaciation, and other dramatic environmental changes, these core metabolic genes for redox chemistry—and, by extension, the major biogeochemical cycles—have been remarkably conserved. This is likely due to the sheer ubiquity of microbial cells in nearly every conceivable environmental niche, as well as their ability to readily swap genes. Viruses, however, typically outnumber host cells in the environment by more than 10:1 and therefore can exert top-down influence over the global metabolic pathway. Beyond directly controlling population abundance through cell lysis, viruses influence genetic expression in microbial populations by transiently or stably transferring functional genes to and from their hosts. This can occur when parts of a host genome are occasionally packaged into viral particles during infection. In these relatively rare events, the viruses act as temporary carriers of foreign DNA. But viruses also have the capacity to integrate this new DNA into their own genomes, thus serving as stable reservoirs of genetic material for metabolic reprogramming of certain microbial populations. In one well-known example, cyanobacterial phages (viruses that infect bacteria) in the open oceans were found to contain bacterially-derived genes for photosynthesis, which temporarily improve host fitness in order to ensure sufficient resources for viral replication. So far, comparatively little has been known about virus-host interactions at depths beyond the reach of direct sunlight, despite the fact that these regions comprise by far the greatest volume occupied by the biosphere. 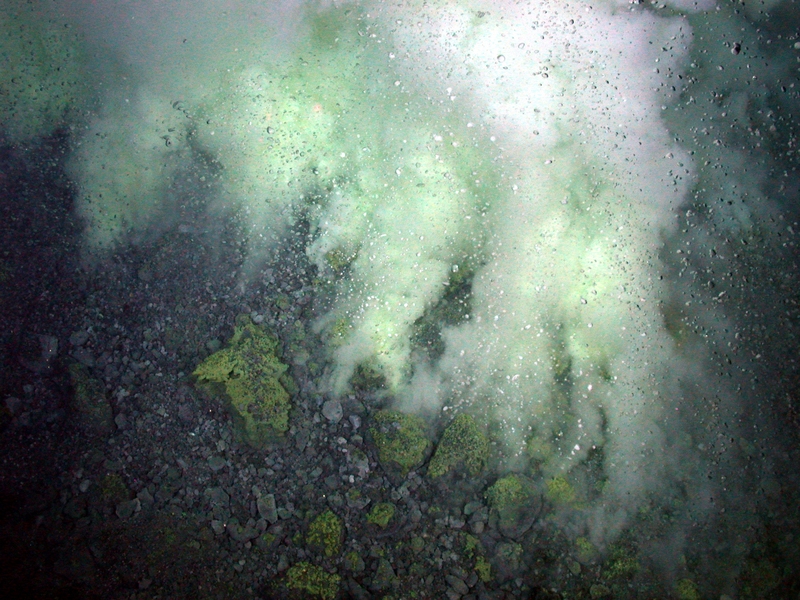 However, a recent metagenomic analysis of seafloor hydrothermal vent samples suggests a role for viral regulation over a part of the sulfur cycle through the transfer of auxiliary sulfur oxidation genes to infected bacteria. A University of Michigan-based team sequenced samples from five Pacific Ocean sites, revealing the presence of genomes from viruses believed to infect an uncultured group of sulfur-oxidizing bacteria known as SUP05. These marine organisms are lithotrophs, feeding off of reduced sulfur species and hydrogen for energy, and occur throughout the deep ocean. Fifteen of eighteen total phage genomes recovered in the analysis contained SUP05-derived genes for sulfite reductase, an enzyme complex needed for elemental sulfur oxidation, as well as several other redox-associated genes. These sulfur oxidation genes don’t appear to be recent hitchhikers in the viral genomes—rather, the sequencing evidence indicates that they have been retained by selection for their ability to supplement their hosts’ sulfur metabolism during infection. Elemental sulfur is a key metabolic intermediate generated by SUP05 bacteria in the course of sulfide oxidation. A bioenergetic model created by the researchers predicted that aerobic oxidation of elemental sulfur, detected at high levels at the sampled sites, could account for up to 93% of the available lithotrophic energy there, providing a strong selective pressure for the retention of sulfur oxidation genes in the SUP05-infecting phage. Already, the data indicate that these dynamics likely play out beyond vent systems localized to seafloor-spreading centers. For example, a broader analysis of viral genomes in the open dark ocean revealed the presence of the same sulfur oxidation genes found at the sampled vent sites. Since the inclusion of host-derived genes in viral genomes might be expected in any environment where a growth advantage for the infected host is essential for viral fitness, it shouldn’t be surprising if increased environmental sampling and sequence analysis reveals similar cases for other environmentally important redox reactions. Such findings may further highlight the unique ecological role of certain viruses in modulating the global metabolic pathway and the biogeochemical cycles it supports. Falkowski, P.G., Fenchel, T., Delong, E.F. (2008). The Microbial Engines That Drive Earth’s Biogeochemical Cycles. Science, 320, 1034-1039. Anantharaman, K. et al. (2014). Sulfur Oxidation Genes in Diverse Deep-Sea Viruses. Science, 344, 757-760.